I collect books. I love to read, but I must admit that I have only read 25% of what sits on my shelves. If I walk into a Half-Price Books or browse the bargain section of any other bookstore I will be sure to randomly pick items that peak my interest. After all – they average about $5 a piece! How could I go wrong?! One day my free time will outweigh my other time and I will be lucky enough to have shelves and shelves of interesting material at my disposal, right? That’s my theory at least. 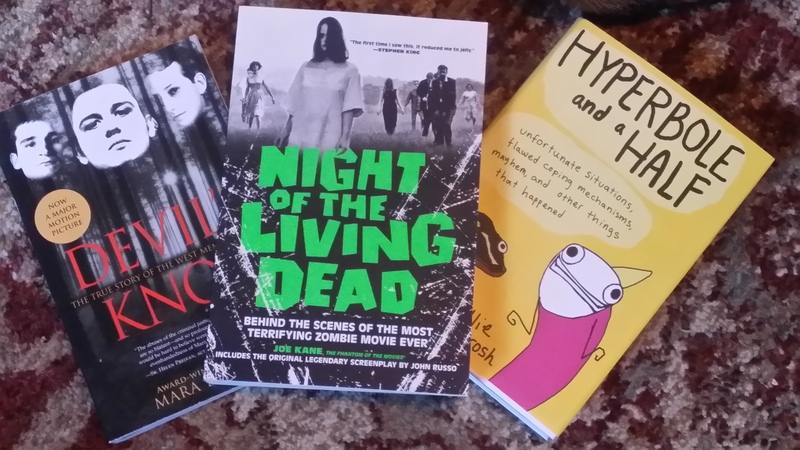 That being said – here’s a couple of my favorites from my latest bargain round-up at Books-a-Million. Pretty much completely unrealted, aside from the fact that I’ve only been able to crack a few pages of each so far. As the back cover reads, “In 2011, one of the greatest miscarriages of justice in American legal history was set right when Damien Echols, Jason Baldwin, and Jessie Misskelley were released after eighteen years in prison. Award-winning journalist Mara Leveritt’s The Devil’s Knot remains the most comprehensive, insightful reporting ever done on the investigation, trials, and convictions of three teenage boys who became known as the West Memphis Three.” I’ve heard of this story many times over, a number of my favorite bands have songs in reference or tribute to these three, and while I understand the basics I’m enticed to read the details. I’m not good at true crime stuff – I’m intrigued by serial killers but can never make it through more than a few chapters before I have to put it away. I, stupidly, tried to read Helter Skelter once and caused myself nighttime stress for months. Hopefully this won’t have quite the same impact. Time will tell. As a huge fan of classic horror movies (monster movies, more so) anything on the topic catches my eye. I love the “behind-the-scene” kind of stuff. It all goes back to when I first picked up “Nightmare of Ecstasy: The Life and Art of Ed Wood” off a shelf in the back room of the comic book store I was working at (I was probably 14 tops). That book solidified my love for B-movies, classic monsters and almost anything shot in black and white. So far I’ve read through the introduction of this book, a written walk-through of the film, and it recreated everything I love about the film. I’ll see how the rest holds up but it will be a good addition to the collection nonetheless. This one I can definitely digest in bite-size chunks. Perfect for my schedule and just right to counteract the fact that when I can finally sit down and read (usually at night) I usually fall asleep after about 15 minutes.